Have you ever seen those beautiful, impressive structures of ancient Mexico that are made out of rock, are wide at the base, have four sides to them and end at a point? Those are called pyramids. Well, school pyramids in Fairfax County VA are bit like them. Wide at the base and pointy at the top. But they’re not made out of rock. They’re simply a concept. In the Fairfax County schools system, a pyramid has several elementary schools which feed onto a couple of middle schools. And the middle schools feed onto one high school. This way, each pyramid has a high school at the “point” of the pyramid, then one or two middle schools in the middle of the pyramid, and about 8 elementary schools forming the base of the pyramid. 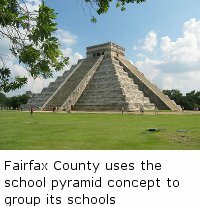 There are a total of 24 pyramids in Fairfax County VA with about 10-12 schools (which are geographically close to each other) in a pyramid. This amounts to over 250 schools in the Fairfax County Public Schools (FCPS) system. In Fairfax County VA, every house belongs to a pyramid based on the home’s street address. Fairfax County VA has very good schools overall, but they are all a little different. Parents might want to have their children attend a particular Fairfax school because of a program available only at that school. To attend that school, the student must live in a house that belongs inside of the boundary of the Fairfax school pyramid. How to find out what your pyramid is? If you are looking for a specific Fairfax school, how do you know which pyramid does it belong to? What if you are planning on your children to attend a specific high school (but they’re still attending elementary school)? You would want to be sure that the elementary schools are in your desired pyramid. To check the current assignments, visit the official school directory on the Fairfax County Public Schools website. Don’t school pyramids change often? “Often” is relative. About every couple of years there are boundary changes due to load re-balancing in the different schools. These are inevitable changes but they don’t just suddenly happen. At least a year or two prior to the change, there are multiple hearings and committees to ensure that the changes are done properly and with the least amount of disruption to everybody involved. A few years ago, (after about two years of prior studies and committees and hearings) the Oakton School Pyramid boundaries changed. Some of the elementary schools which used to feed into Oakton High School got re-assigned to other pyramids. 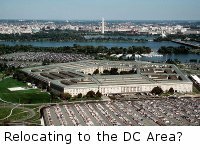 And elementary schools, such as Navy, which used to belong to Chantilly’s Pyramid, got assigned to the Oakton Pyramid. A school pyramid is a grouping of one Fairfax high school, one or two middle schools and up to 10 feeder elementary schools. Pyramid groupings can change every couple of years but not without careful study and good cause.